That's so cool! I bet the book looks amazing and I can't wait to see it! pre-congrats on the book, Andrea. Can't wait to see it. Don't worry! I admire you. I'm sure this book will be utterly gorgeous. I'm happy for you, Andrea! Mum's the word....can't wait to see the book! We'll keep it schtoomed! Can't wait for all the new drawings, that corkscrew is bloody amazing. Thanks for not sharing any images from the new book. :) We never saw a thing pass between you and our computer screens...must be all the red wine. All I can remember is a cork falling off the table and rolling on the floor. Hum....:) You and your blog are so much fun! And you are right---you should never go more than a week with out a post! Wow. It looks real. I could smell the wine on the cork. Hmm - I feel a tipple coming on. Really looking forward to seeing the rest of the pictures. Yippee! I can't wait to see! Okay, mouth is shut but I still can't contain my excitement! You know, I'll have to sit on my hands too! This is gonna be torture! Hurry up, my friend!! i'm in line to purchase anything you create, so am looking forward to the book. congratulations!! woohoo!! Congrats!! :) So awesome. LOL Andrea you are so funny! You're a wicked little tease! My monitor is blank. Me? - never saw a thing !!! Really looking forward to your new publication (very exciting ) - how and when do we get out hands on it???? Oh Oh! OH OH! OH MY!!!!! I canNOT wait to see this book!! Do be sure to let us know as SOON as it is printed! And post looks of pix!! Wonderful news my dear... just wonderful... what was it now? I admire you. Hope you keep up showing us your work. And pre-congrats for the book. is that just pencil colors? Thank you all, folks! I knew my secret was safe with you. I'm not sure how interesting the book will be to you - as it is going to be published in Italian?! I'm hoping that they go for an English version too, though. Maybe if enough people request it. It was fascinating to finally actually illustarte a book. A very interesting experience that I hope to do lots more of in the future. I'll talk more about it when I can! Steve, no, by the time I got down to it I was so focused on getting it done I didn't think about much else. I really enjoyed that time. having nothing to do but draw. I do think that sometimes I work best when I'm under pressure. That's what I tell myself anyway. Lino, the outline and some of the detail was put in with a sepia ink. The rest is colour pencil. In Italian? That's ok for us then, just say where and when..can't wait! As for the peek, non ho visto niente. Exciting! That drawing is spectacular - love the perspective! This is very encouraging news. I only say this because one of the last times I visited your blog, you were soliciting suggestions on how an artist can market her talents. So, now I am wondering if this book was a result of having 'put yourself out there' in some way since that time(?). How did these perceptive folks find you? When you can, please tell all about the business side of your endeavors! Here's to many more illustrated volumes by AJ. I am now going to 'subscribe' so I can get the first word on the release. 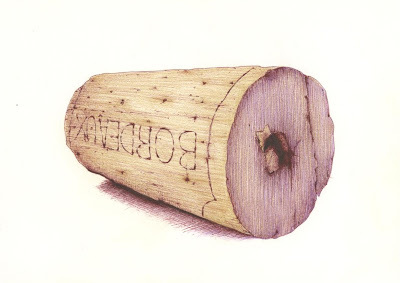 whoa bro, you draw a hell of a cork. I'm telling my dog about this one, and you'll just have to accept the fact. I'm so happy for you. Can't wait to see it.